Combine all the ingredients in a bowl and mix with a hand mixer on high speed until fluffy (you could also do this in a stand mixer). The buttercream will keep in an airtight container in the refrigerator for up to 2 weeks. In a large bowl, combine all the ingredients with a whisk. Store in an airtight container in the refrigerator for up to 1 month. Mix the sugar and starch together in a food processor, pulsing until you have a fine powder. The night before, soak the figs in the red wine in the refrigerator. Be sure they soak for at least 5 hours, or up to 12. 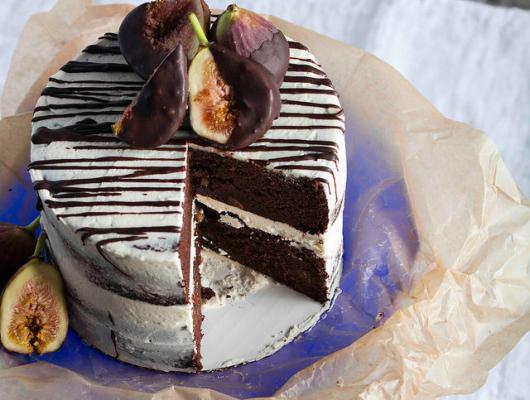 Before making the cake, drain the figs and cut them into 1/2-inch slices. Discard any remaining wine. Preheat the oven to 350°F. Grease two 6-inch cake pans pan with the shortening. In a medium bowl, combine the flour, cocoa, baking soda, baking powder, vanilla, espresso, and salt and whisk out any lumps. In a stand mixer with a whisk attachment, combine the banana, applesauce, milk, sugar, maple syrup, and olive oil. Slowly add the dry ingredients to the wet, mixing on low speed as you go. Add the warm water and mix until everything is thoroughly combined. Add the melted chocolate and mix again. Fold in the sliced drained figs. Pour the batter into the pans, dividing it evenly, and bake for 35 to 45 minutes, until a toothpick inserted in the center comes out clean. Let cool completely. Once totally cool, put one layer on a plate and cover with buttercream. Top with the Second layer and frost the top and sides. 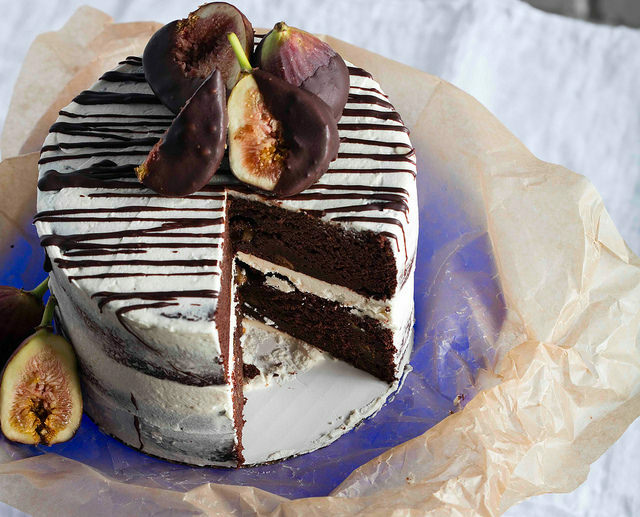 To decorate with chocolate-covered figs, melt the chocolate chips and butter in a bowl in the microwave, stirring after every 15 seconds until smooth. Dip the whole figs in the chocolate, fully or halfway, and put them on parchment paper to cool and harden. Place them on top of the cake. This recipe is excerpted from the book JENNIFER’S WAY KITCHEN by Jennifer Esposito with Eve Adamson. Copyright © 2017 by Bern Productions, Inc. Reprinted with permission of Grand Central Life & Style. All rights reserved.